Almost two years ago I published evidence that many chiropractors were sneaking into hospitals, without permission, to check, adjust and/or manipulate their customers. Last week we were informed that a notification had been lodged against Ms Helen Alevaki, the president-elect of the Chiropractors’ Association of Australia; and that Alevaki had been investigated by AHPRA; and that she had agreed to undertakings imposed on her by the Chiropractic Board of Australia. The next head of the Chiropractors’ Association of Australia has admitted she was “wrong” to brag on social media about sneaking into hospitals to treat babies. But Helen Alevaki (pictured) has dismissed claims her actions, which led to sanctions by AHPRA, leave her unfit to lead the profession’s peak body. Health blogger Reasonablehank, who outed Ms Alevaki in 2013 along with several other chiropractors who also claimed to have made secret hospital visits, said the admission makes Ms Alevaki’s position as president-elect “untenable”. But the Melbourne chiropractor rejected this, claiming her experience will actually see her better placed to lead. She said the issue did not arise during discussion over her election. Before we continue there are two major points we need to address at a later date. And, by “we”, I mean AHPRA, the Chiropractic Board of Australia and the CAA. …a flyer was posted out by the Alevaki team. It included many names who were willing to back her ticket, in writing: of the 42 names, 20 have appeared in the pages of my blog, either due to anti-vaccinationism, or sneaking into hospitals, or both. That is really bad. Included in that list are former CAA National and NSW board members, Tony Croke, Nimrod Weiner, and Shakespeare. All three had their terms ended prematurely. Of Alevaki’s three running mates only Patrick Sim has featured in my blog, for anti-vaccinationism. 2. I am not aware of any other chiropractor facing investigation for practising in hospitals without permission, despite the clear evidence being published in September 2013. Again, this is almost two years ago. KIM LANDERS: The Chiropractors Association of Australia is in turmoil with the resignation of its president-elect over an unauthorised visit to a maternity hospital. Dr Helen Alevaki reportedly used a closed Facebook group to reveal that she had made quote “sneaky” visits to a Melbourne maternity hospital to perform treatment on a baby. The name of the hospital has not been disclosed. Dr Alevaki has been under investigation by the Australian Health Practitioner Regulation Agency (AHPRA) but is being allowed to continue to practice. NANCE HAXTON: The resignation of Dr Helen Alevaki means the Chiropractors Association of Australia has lost its board director and its president-elect. The association’s CEO Dr Matthew Fisher says the current president accepted her resignation in the wake of a recent investigation by the health regulator into her conduct. MATTHEW FISHER: Well, there was a complaint heard by the health regulator with regard to a statement that Dr Alevaki had made about entering a hospital on the request of a parent to provide some treatment to a child. 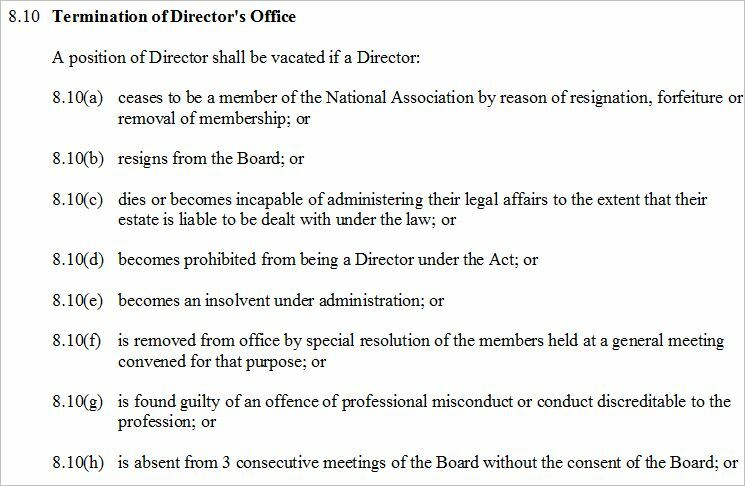 And, this was heard by AHPRA and subsequently some undertakings were made for Dr Alevaki with regard to continuing professional development and what that has meant is that, in accordance with our constitution, she’s unable to continue as the director and she has made the decision to resign. NANCE HAXTON: So is that because of concerns of entering the hospital without the permission of the hospital? MATTHEW FISHER: That’s probably the basis of the matter. The fact that, to provide services within a healthcare facility, you need to be credentialed even if you do have permission, so in fact – and Dr Alevaki has admitted this. So, the CAA is back where they started. They are again without a president. They were acutely aware of the problems inherent in the Alevaki ticket’s bid for board positions. They ignored all of these concerns. I would argue that these concerns were ignored due to ideological reasons first and foremost: the Ierano ticket was not fundamentalist and reactionary enough; Ierano and his ticket had been using the dreaded “E” word – Evidence. There was not enough subluxation in Ierano‘s kit and so the subluxationist ticket won. If you really want to do your head in, here is a list of 172 more Australian chiropractors listed as members of that anti-vaccine chiropractic paediatric organisation. And don’t forget how many CAA members are/were members of the thoroughly disreputable anti-vaccine organisation, the Australian Vaccination Network. 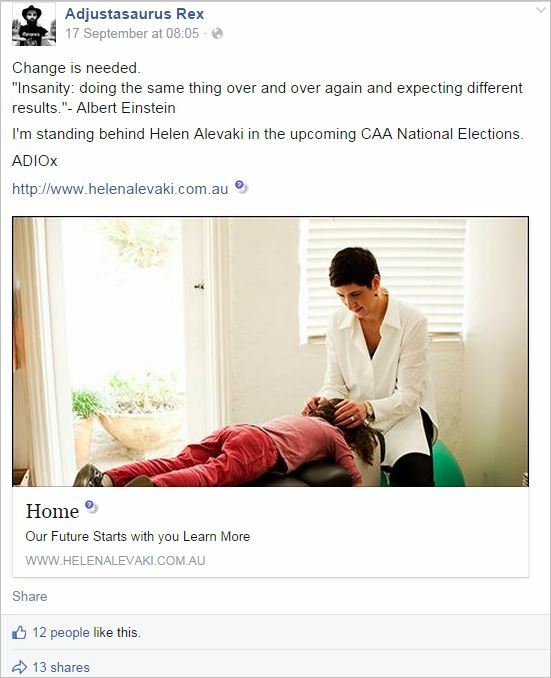 I think Australian chiropractic just dodged a public health bullet with Alevaki’s resignation. Let’s see if they learned anything. Judging by the growing Australian membership of the ICPA I doubt it. And judging by the continued hubris of the subluxationist/vitalist wing of chiropractic I doubt it even more. Chiropractors: if you want moderate, reasoned representation, go and join Chiropractic Australia and stand by their ideals. The future of your profession is in their steady hands. This entry was posted in anti-vaccination dishonesty, australian vaccination network, chiropractic, skeptic, stop the australian vaccination network and tagged AHPRA, anti vaccination, ASRF, Australian Health Practitioner Regulation Agency, Australian Spinal Research Foundation, australian vaccination network, Australian Vaccination Skeptics Network, AVN, AVsN, CAA, CAA VIC, CBA, Chiropractic Board of Australia, chiropractic4wellness, Chiropractors' Association of Australia, Chiropractors' Association of Australia Victoria, Helen Alevaki, ICPA, Joe Ierano, Tim Shakespeare. Bookmark the permalink. I’m sorry Hank, you’ve got something wrong. Chiropractic Australia is as evidence based as a bowl of homeopathic soup. Oh they’re reasoned? Not rabidly anti-vax… Are you sure? There is some reasonable evidence for acupuncture, and Bowen therapy is a massage technique that needs some quality research before meaningful conclusions can be drawn. What we have is the situation common to many therapies – a lack of evidence of efficacy, not evidence of a lack of efficacy. Not yet at least. Anyway I hear you and do certainly agree that by listing certain marginal techniques on our web site it could be misconstrued that we are condoning those procedures. Thanks, we will tidy that up. Only time will tell if we live up to our goals of stewarding the chiropractic profession to a more modern, evidence-based reality. It’s early days for Chiropractic Australia but we owe it to our patients and others in the health care system to make his work. You know the profession is headed down the toilet when someone like Ierano isn’t woo enough. It seems with chiro it is all shades of grey. When it comes down to it even the most evidenced based of them is stil firmly on the woo side of the spectrum. You just reminded me to add some links to his name. I was rushing out, earlier. 1. Point out the BS. 2. Point out whats right and support. It is a sign of maturity within a profession how it engages with the critics. I appreciate critics like Reasonable Hank who have done more for the reform process over the last two years than anyone I know. Thanks Hank! Good to see Rod coming onto forums like this and talking to the critics and answering their questions. We need more leaders like you. Thank you Rod for your continuing hard work over the last 3 decades it is appreciated! Cheers! Hello, Katelyn McGregor of Pioneer Chiropractic in Geelong has also been reprimanded by AHPRA and has been ordered to undergo proper practice training. These unethical breeches are criminal. It has nothing to do with chiropractic medicine as no school in the world teaches that sneaking into a hospital and adjusting an infant is ethical or medically necessary. Remove their licenses and this behavior will stop.